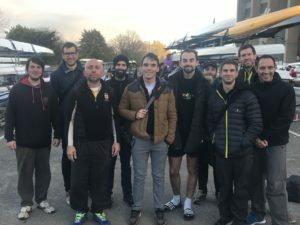 It may have been a chilly and windy October day, but that didn’t stop YCRC at the Nottingham Autumn Heads, raced on the River Trent over the weekend. Kicking off Division 1 (Nottingham Sculling Head) was a trio of intrepid scullers, Margit, Astrid and Anne, who battled it out over 4.5km. Anne and Margit won their categories in style, in WMasA and WMasC/D respectively. Astrid was racing time only, but her time would have landed her at 58th overall, super considering she was the youngest competitor in the division! YCRC scullers at Nottingham Autumn Head Photo: M. Rezacova. 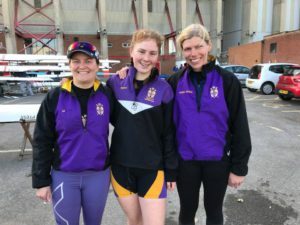 Our sole YCRC representatives in Division 2 (Nottingham Beginners’ and Juniors Head) were our J154x+, racing over 2km through the city – whilst others warmed their toes up indoors, our girls rowed to 2nd in their category, a great result! The next YCRC crews went off in Division 3 (Nottingham Small Boats Head) over a shorter, but no less hard-fought 4km. All the men’s crews came home in the top 30, with the J184x- (Machado) absolutely flying to third overall, only two seconds behind the senior winners. The B1.4x- (Barker) came 8th, B2.4x- (Alexander) 12th, and the Mas B/C 4x- (Goodall) 29th. On the women’s side, the WB1.4- (Waller) stormed through as the fastest women’s 4- (and fourth fastest women’s crew), with the WB1.4x- (Sneath) coming home 50th overall, despite losing their steering. Many of these crews will be in action in two weeks at the Veteran Fours Head and Fuller Fours Head of the River – stay tuned for how they get on. YCRC Men’s… Photo: C. Barker. 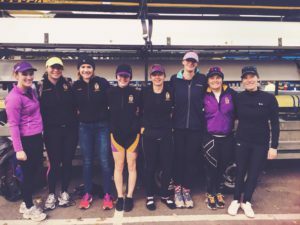 …and women’s squad at Nottingham Autumn Head. Photo: M. Alexander.